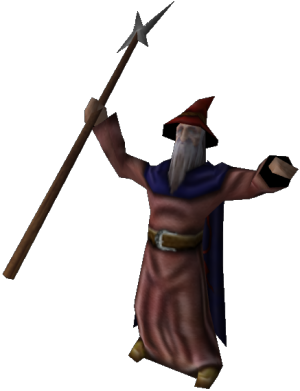 Magic is a faction in the MegaPack techtree made by the Glest Team, with some modifications by Titus Tscharntke. Magic features a large number of units rotating around a magical and darker theme. 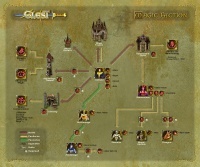 Adapted from the Magitech techtree, Magic is based on a high fantasy magician and summons theme, with units ranging from lowly battlemages to the powerful dragon. Magic's archmage is a powerful, but vulnerable, unit. 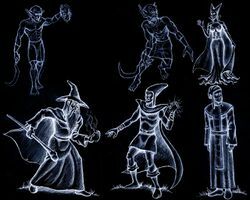 Magic's daemon's and battlemages are very easy and quick to create, and require no buildings, allowing you to produce them quickly and attack your foe before they can get enough units to overwhelm you. Your units will need to take care of the foe's military first, while staying out of range of their defense tower to cripple them. You may wish to camp outside of their range and focus on their workers too, as that will eventually deplete all the foe's resources. The dragon is a fearsome foe, and used correctly, it boasts overwhelming strength in numbers. When using dragons, first sweep through the area with fast units such as the Drake Rider, destroying anti-air units like the air ballista. When you finally attack your foe, focus on ranged units such as the archer first, as they are able to attack the dragons. Once all ranged units are gone, the melee units are helpless against the dragons, allowing you to pick them off one by one. The dragon is a mighty air foe, and incredibly dangerous in large numbers. Magic attacking a foe's base. This page was last modified on 18 June 2016, at 22:24.